This summer we created a project with mac Birmingham inspired by the ARTIST ROOMS: Jenny Holzer exhibition. You Must Disagree with Authority Figures captured the opinions, fears and hopes of young people, families and community groups in their own voices. 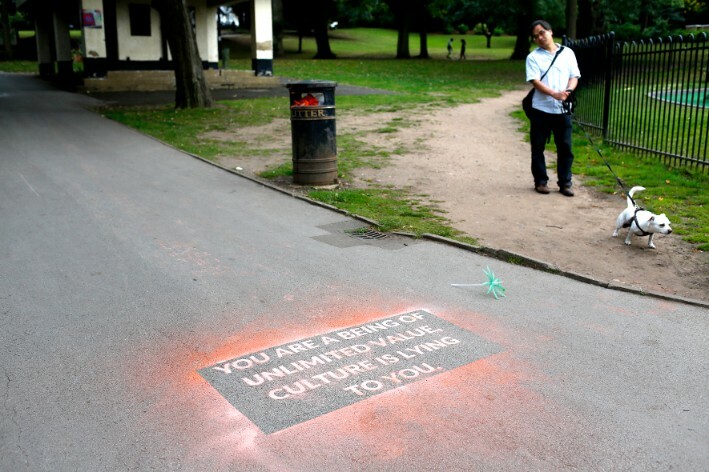 The activity culminated at the end of the summer with an artistic disruption to the public spaces at mac and Cannon Hill Park with politically informed interventions and public performances which were developed over a weekend lab with artists aged 16 - 25. Over thirty thousand visitors experienced the activity over the weekend-long interventions, giving the young artists a unique opportunity to develop site specific work, and to exhibit to a large public audience. 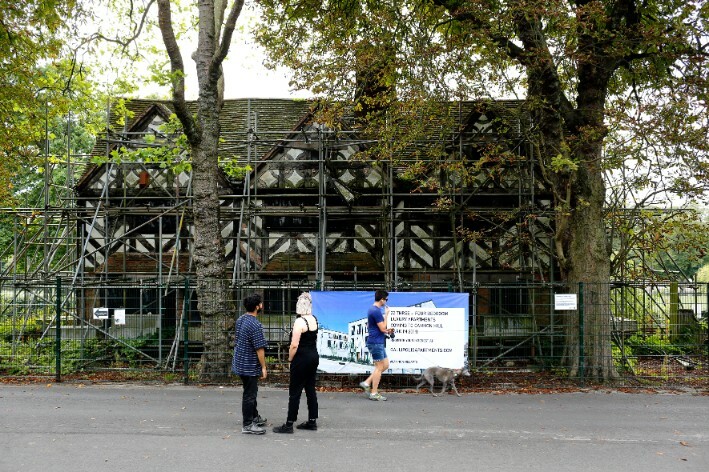 Inspired by the prevalence of the term ‘fake news’ in politics and the media in 2017, the artists designed fictional hoardings that advertised luxury apartments being built in Cannon Hill Park in 2019. Designed to shock observers into considering the cultural value of free, open, democratic public spaces, the work was informed by the artists’ concerns around private landowners buying public land across the UK. Tara and Amrit are both based in Manchester. Jade’s spoken word performance piece presented the bleak reality of a postgraduation student life saddled with student debt and the difficulty of finding work, affording food and living with mental health problems. Positioned above mac’s cash machine, visitors were confronted with the artist’s own weary voice intercut with the same statements in an anonymised voice that suggests the universality and shame of debt, along with media debates on the issue. Jade recently graduated with a BA (hons) in Fine Art from University of Derby. She currently lives and works in Sandwell, West Midlands. Dead Shrine was a large scale sculptural work informed by shifts in the socio-political landscape and public speech in the past 12 months. Communal spaces now hold new and often foreboding forms that did not exist there before. Public Spaces. Public Food was a food based work which suggested a possible social policy in which public spaces such as parks are used for the growing of free food, empowering visitors to consider an alternative to the current food industry. Jonathan Graney and Dale Hipkiss are based in Birmingham. They play with alternative social narratives and realities, often reaching into the fantastical, to create objects and spaces. Inspired by Holzer’s Truisms, Amarno appropriated statements from literary figures and embedded them as bold provocations to park visitors. Like Holzer, Amarno has used the vernacular of the street; in this case stencil and chalk paint. Amarno is an upcoming, Birmingham-based visual artist whose work is political in nature. He is passionate about creating and solidifying community bonds within urban communities, by developing creative outreach programs that empower and inspire. Liz created a fake launch for a fashion brand, creating a line of T-shirts featuring slogans that play on the marketing campaigns of major fashion and beauty brands, which co-opt, repackage and sell back to consumers the ethics they already have. In addition to posters and advertising throughout mac, this brand also held a catwalk show on mac’s terrace on 25 August, featuring genuine models. Liz is a performance artist and professional model based in Birmingham. Chloe’s work addresses the dramatic rise in homelessness in Birmingham and other cities in the UK. 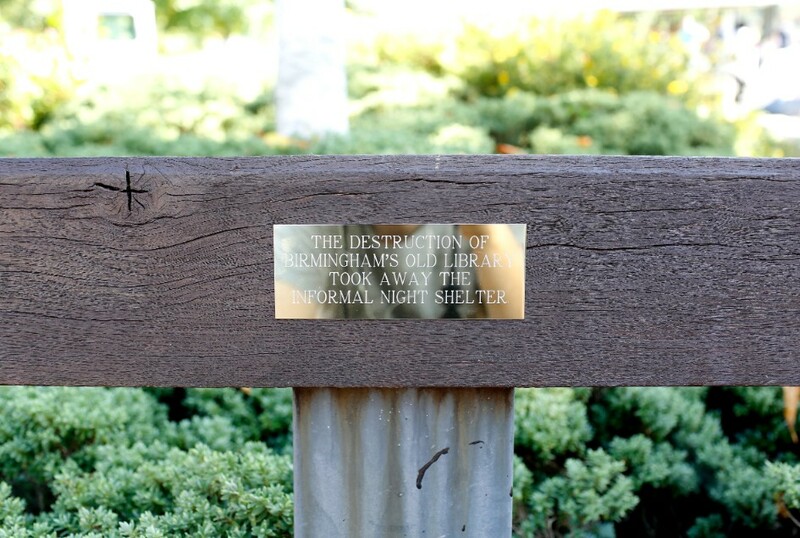 Utilising park benches, the stereotypical symbol of sleeping rough, this work consisted of a series of brass plaques featuring statements taken from Crisis’ Impact Report 2016. It asks visitors to consider the plight of people who are homeless. Chloe is a composer and singer-songwriter, and has recently completed her Masters in Composition at Birmingham Conservatoire. Maniba’s short film used the language of advertising and the cut and paste nature of YouTube to convey a barrage of political messages. Maniba merges her background in marketing and business with a passion for youth work, arts, social action and diverse settings. A huge thanks to all of the artists named above along with all of the participants and staff from Crisis Birmingham and St. Chads Sanctuary. Thanks to Jess Litherland at mac Birmingham, ARTIST ROOMS, Cannon Hill Park, Frilly, Mark Murphy, Scott Johnson, The Holodeck. The ARTIST ROOMS collection of over 1,600 works of modern and contemporary art is displayed across the UK in solo exhibitions that showcase the work of more than 40 major artists. ARTIST ROOMS Jenny Holzer at mac Birmingham was part of a touring programme that gives young people the chance to get involved in creative projects, discover more about art and learn new skills. Since 2009, 40 million people have visited more than 150 displays at over 75 museums and galleries. The ARTIST ROOMS collection is jointly owned by the National Galleries of Scotland and Tate, and was established through The d’Offay Donation in 2008, with the assistance of the National Heritage Memorial Fund, Art Fund, and the Scottish and British Governments. YOU MUST DISAGREE WITH AUTHORITY FIGURES was created in partnership with ARTIST ROOMS and supported by Arts Council England, Art Fund and Creative Scotland.